Adorn yourself with new mixed-media jewelry techniques with the best jewelry segments from The Mixed-Media Workshop Season 100. Let hosts Julie Fei-Fan Balzer and Jenn Mason show you how to create stunning art using the latest and greatest mixed-media techniques and materials. Shrinktastic: Incorporate shrink plastic with paint pens and inks to make beautiful earrings, pendants, and buttons. Metal Blankness: Learn three ways to use metal blanks and add creative finishes to them. Polymer Bezel Fun: Create a unique clay-filled bezel, adding texture with a hand-carved stamp. 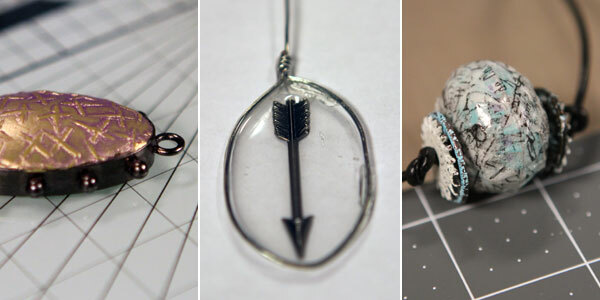 Backless Bezels: Create free-floating charm earrings with resin and wire. Bottle Caps Can: Hammer and collage bottle caps to create unique beads. Felted Jewelry: Jenn and Julie duel to see who can create the better piece of felted jewelry. Chevrons R Us: Discover how to use canvas and stitching to make a soft pendant. Journal Necklace: Make a tiny journal necklace for journaling on the go. Order or download your copy of Season 100: Best of Mixed-Media Jewelry today!